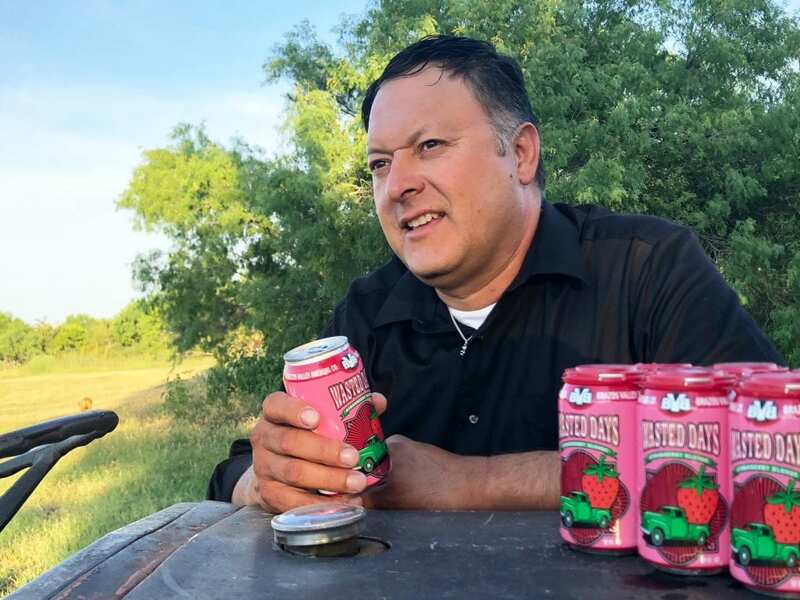 Earlier this spring, Poteet strawberry grower Donovan Garcia of Garcia Farms North teamed up with the Brazos Valley Brewing Company to create “Wasted Days” Strawberry Blonde Ale. Based in Brenham, the company opened about four years ago. “It was started by two brothers and their two childhood friends. They were avid home-brewers and they got the wild idea to start a brewery. 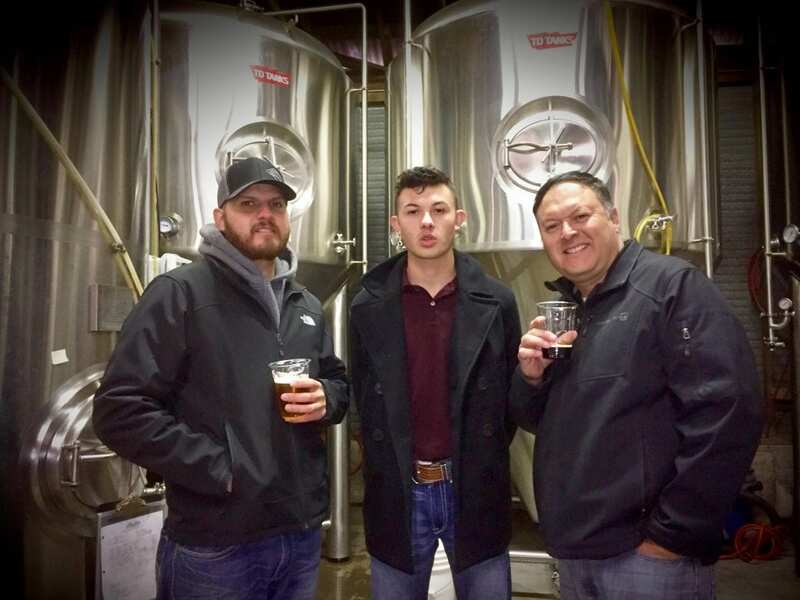 It just kind of snow-balled from there,” said Avery Clayton, Brazos Valley Brewing Co. production manager. Wasted Days is a blend of the ale and strawberry puree. Clayton explained they take the strawberries, clean them and blend them into a puree. Then it is purged with carbon dioxide and later pasteurized. It is then blended with the ale at the tail end of fermentation. She also explained the lengthy process of beer making. While the whole brewing process is only about a six hour process, the fermentation takes two to four weeks. Although Clayton was unable to attend the Poteet Strawberry Festival in April, a couple of their representatives were able to go. “They had a blast and they loved it. I’m going to have to come back next year for sure,” said Clayton When the company was looking for a strawberry grower to collaborate with, Clayton started emailing the list of growers she found on the Poteet Strawberry Festival website. “Donovan called me and left two voice-mails and he said, ‘Oh my God, let’s do this!’ He was so excited about it, so I said, ‘Okay, I found our guy,’” Clayton said. In early May, she had the opportunity to visit Garcia Farms for the first time. On that particular day, Donovan and wife Shawna picked berries in the intense heat for the second batch of Wasted Days Strawberry Blonde Ale. “For the first batch, Donovan met us a little bit closer to Brenham to make it a little bit easier. Today I wanted to come out and see the farm and meet him in person,’ said Clayton. She describes the beverage as crisp, but with the sweetness of the strawberries. Since so much fresh fruit is used, it also has a hint of that tartness on the end. “There are two different batches, so there could be a slight variation. Donovan was saying the sugar content in this batch will probably be a little bit higher. It’s real hazy- it’s not a clear beer. It’s real hazy because there is so much strawberry matter suspended in the beer,” Clayton added. A small portion of the second batch also includes strawberries from the farm of Selso Garcia, Donovan’s brother. The first batch of Wasted Days was carried in cans by stores like Spec’s and some of the bigger H-E-B stores. The second batch won’t be canned. It will be only in kegs. One of the places in San Antonio that currently has Wasted Days on tap is the Flying Saucer. Donovan Garcia said, “When we were given the opportunity to grow strawberries for this project we were floored as well as honored. It was a chance for us to showcase Poteet in yet another positive light. The Poteet Strawberry Festival is only one weekend a year, but this beer would be around for awhile, or so we thought. Apparently the beer flew off the shelf at an astonishing rate. They sold out immediately. That made the grocers happy and that left us wondering, ‘Is the beer really that good?’ It was!